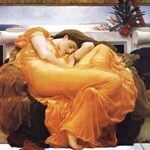 1st Baron Lord Frederic Leighton (3 December 1830 – 25 January 1896) was the chief proponent of the Classical revival in the arts in late Victorian England. His paintings and sculptures evoked the formal values of ancient Greek statuary and Renaissance masters such as Raphael and Titian, and sought a higher moral consciousness through religious and mythological themes. 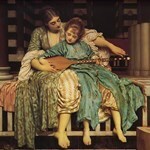 Although born in England in 1830, Leighton spent much of his childhood traveling throughout Europe with his family. At the age of sixteen his family settled in Munich am Main, Germany, where Leighton enrolled at the Stadelsches Kunstinstitut. There he studied under the Nazarene artist Edward von Steinle. Consequently, the Nazarene aesthetic, which reinvestigated the simplicity and rectitude of early Renaissance painters, heavily influenced his early work. However, his later work, while still retaining its moral character and formal clarity, was influenced by the highly decorative and ambiguous motifs of the Aesthetic Movement. Such an example of his later work is "Flaming June" c.1895. In it, Leighton merely alludes to mythic subjects by setting a vaguely Grecian maiden in a Mediterranean background and pays greater attention to lavish color and fluid drapery. Image Size: 27" x 28"
Image Size: 24" x 27"
Image Size: 19" x 19"
Image Size: 8" x 9"
Image Size: 45" x 28"